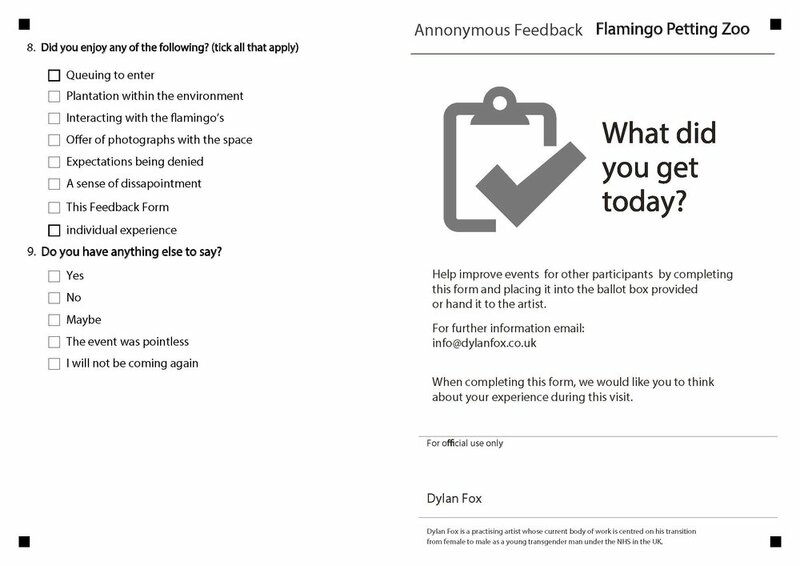 Flamingo Petting Zoo, 2016, audience participation, petting zoo, and replenishable feedback form, dimensions variable. 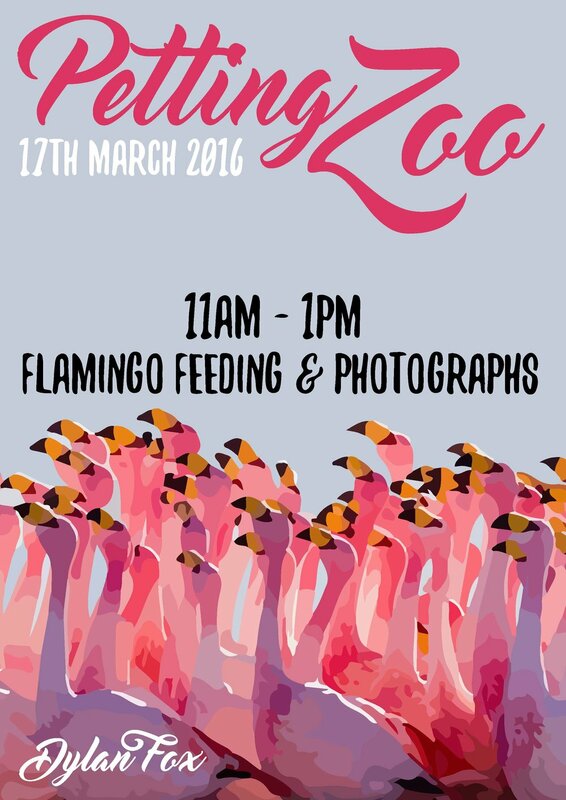 Flamingo Petting Zoo takes its inspiration from the hospital on 'Flamingo Road' in Florida, where the artist underwent Top Surgery in March 2016. It is closely linked to the idea of authorisation and disappointment within the UK NHS Transgender healthcare system. Upon arrival, each participant to this piece is required to wait for an indefinite amount of time, before entering the flamingo enclosure. 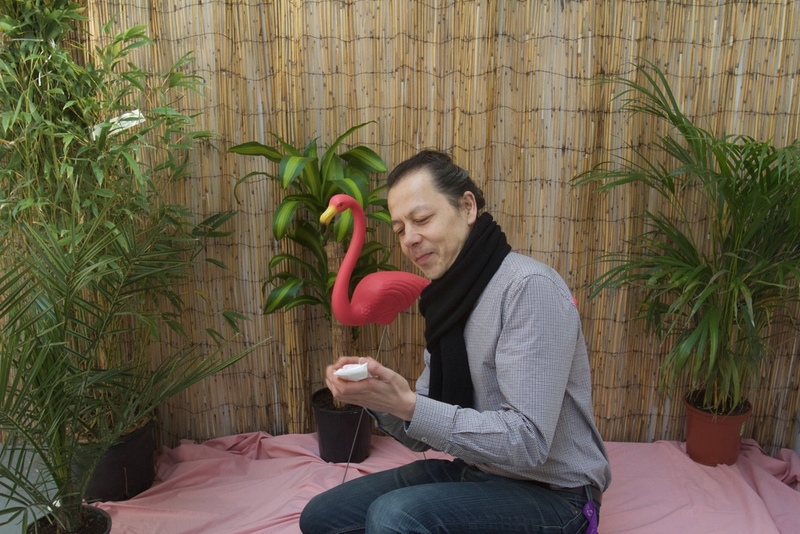 When each participant reaches the interior of the enclosure they are confronted not with real flamingos but with fake lawn flamingos and a realisation that their time spent waiting has been for nothing. This sense of disappointment is key to understanding some of the artist’s own experiences during transition. 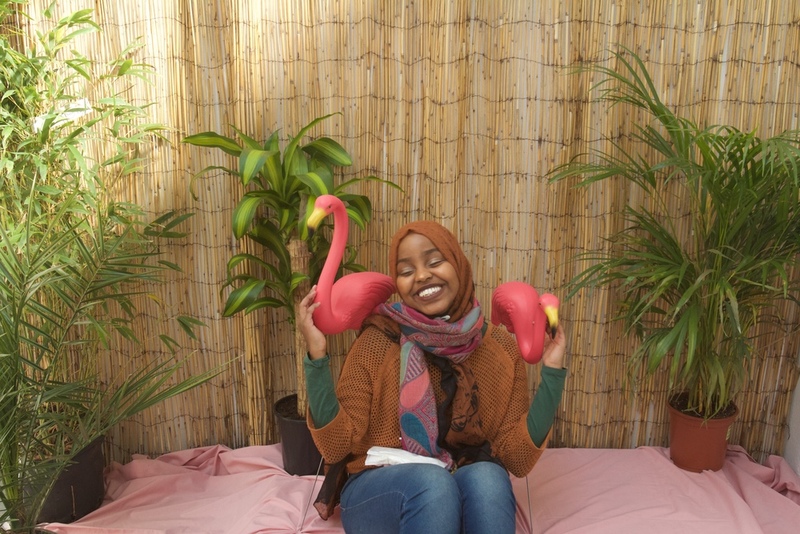 Each participant is then instructed to fill out an edited NHS Feedback form to anonymously record their experiences of the petting zoo, invited to have a picture with the flamingos and given some shrimp sweets as a consolation for the lack of real flamingos. Utilising the effects of lying or betraying the viewer by thinking of the artist as a trickster, this piece builds a level of hype prior to the arrival of a petting zoo, raised further through targeted advertising and word of mouth. This is to increase the level of expectation from the viewer to a greater extent which purposefully can never be met honestly by the artist, when ultimately the event will never happen in the way it has been advertised. 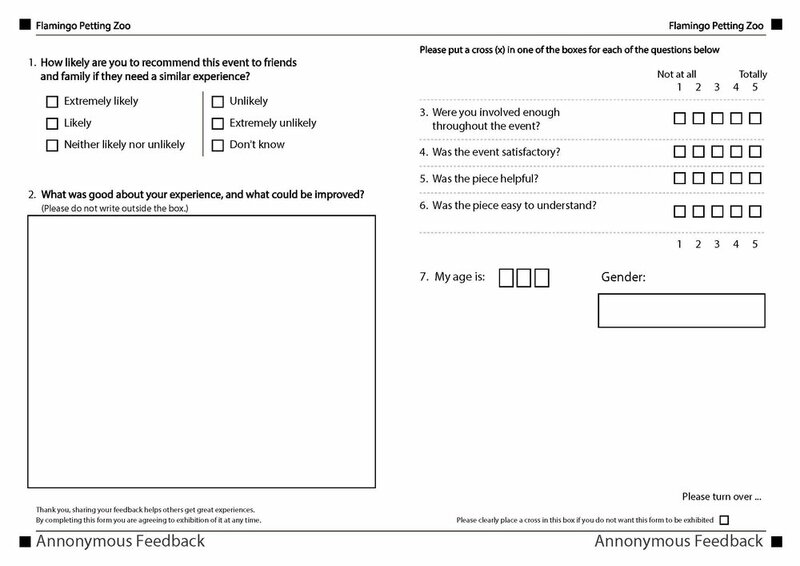 It has a level of personal interaction with each participant so that they leave happy enough not to complain but still not fully satisfied having been slightly misled in their expectations of the event. It is this act of deliberate false advertising that is used to disappoint the participants, hopefully reaching a level parallel to how the artist themselves have felt when their own expectations of gender transition have not been met.